Domestically prepared with a dried bonito flake soup stock as a base, it offers a light, delicious flavor. 2 people can easily by satisfied splitting a 180 gram bag. 360g (180g × 2 bags). This savory Cup-Steamed Egg Custard is made with chicken, spinach, mushrooms, bamboo shoots, and gingko. It makes for an excellent base to a delicious, nutritionally well-rounded meal. The high-quality chicken is an excellent source of lean protein, in addition to adding body and flavor to the meal. The mushrooms, spinach, and bamboo shoots are all rich in various vitamins and minerals, and provide ample amounts of dietary fiber. 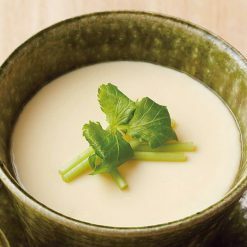 This dish, known in Japanese as chawanmushi, is renowned as a distinct, delicately-flavored take on egg custard. It uses a distinctively high ratio of liquid, and is carefully prepared so as to ensure a smooth texture. 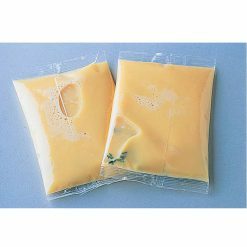 Our Cup-Steamed Egg Custard can be prepared by a simple thawing method, or by steaming. Place in the refrigerator, or under running water if you’re short on time. Otherwise transfer into a bowl, place in a steamer, steam on high for 2-3 minutes, and then on reduced heat for 10-12 minutes.Often eaten as a side dish, a heartier version can be made by adding udon noodles. Excellent as a side dish to a larger meal, or as a between meal snack. This product contains eggs (domestic), seasoning extract (dried bonito extract, yeast extract, codfish extract), chicken (domestic), shiitake mushrooms (China), spinach, bamboo shoots, ginkgo, sugar, mirin, salt, soy sauce, yeast extract (includes raw wheat). Origin of ingredients: eggs, chicken (domestic). Prepared and packaged in Japan.